UK – Adlib was the audio supplier for the incredible – and apparently final – Giant Spectacular show staged in Liverpool, produced by the iconic street and outdoor theatre company Royal de Luxe, who are based in Nantes, France. This involved on-board sound systems mounted to the supporting structures for each of the Giants and a custom Music Truck which featured a live band, as well as providing several reinforcement PA systems, which travelled to the different gathering points along the 20-mile route. 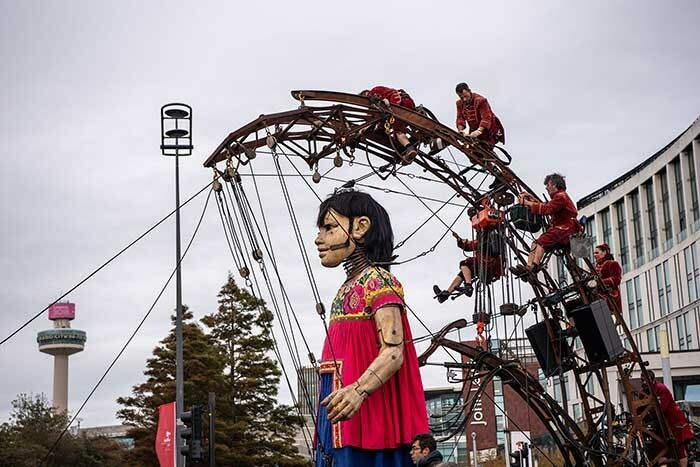 The extravaganza attracted an estimated 1.3 million people to the city centre over the weekend of 4th – 7th October to see this final tale of epic proportions, and the fate of the much-loved oversized marionette puppets unfold. 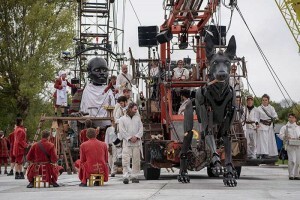 The giant larger-than-life characters comprised The Explorer, the Little Boy Giant, his dog Xolo, and a surprise appearance by the Little Girl, who re-entered the story on the Sunday for the finale. It was the third Liverpool Giant Spectacular, and having delivered the previous events in 2012 and 2014 so successfully, Adlib was commissioned by production manager Stu Stalker of Event Design Co (EDC) and Royal De Luxe’s production manager Jeff Havart to provide audio for the city’s final Giant Spectacular. 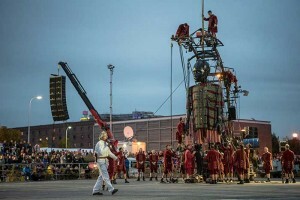 The performance’s theme was “Liverpool’s Dream” and it was part of Liverpool 2018, an initiative celebrating ten amazing years since the city’s ground-breaking 12 months as European Capital of Culture in 2008. 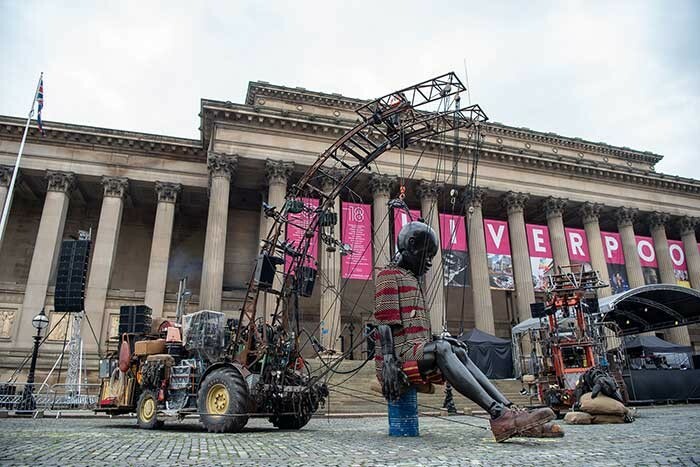 The Giants route started at the St George’s Hall Plateau for the Little Boy Giant and over in Fort Perch Rock in the Wirral for The Explorer, ending at Canning Dock. The meticulous planning and detail needed to deliver a show of this scale and complexity started back in April, with Adlib’s Phil Stoker and Stu Stalker building on their previous experiences and knowledge of what were the best and most efficient working practices to deliver this event. 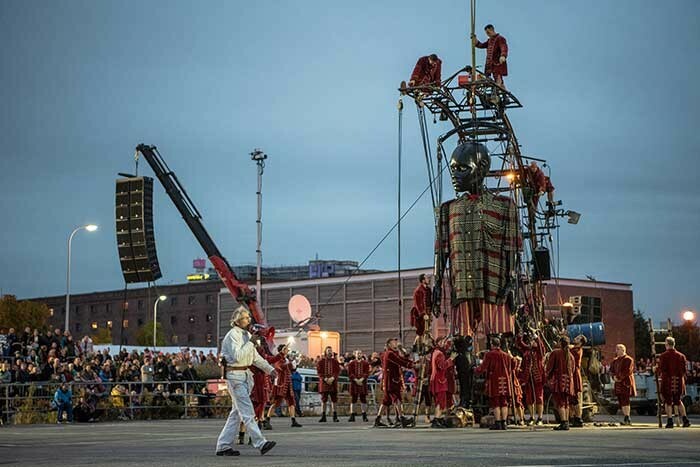 Adlib’s Leah Coyle was the lead project manager / account handler, collaborating closely with EDC and Royal de Luxe’s sound designer Stéphane Brosse to produce a specification suitable for such a dynamic event. Stéphane had some very particular requirements for the on-board PA systems, each of which featured a stand-alone audio set up delivering special effects, each with the capability of being linked together to interact with one another if needed. Each Giant also had its own on-board monitor system which was used to communicate “orders” to the many people (‘Lilliputians’) required to operate and drive the massive pulleys and rigging systems that enabled the articulated joints and wheel bases to move the marionettes. Stéphane stipulates L-Acoustics systems exclusively for these shows, primarily for the wide range and flexibility of its products, the efficiency of the enclosures. plus the fact both companies are French makes L-Acoustics a first choice here. On a more general level, Stéphane has a historic relationship with the brand’s touring support team and of its global availability via the L-Acoustics rental network, which aids continuity between shows around the world. Each of the Giants' PA’s were positioned and secured in place with several bespoke brackets and rigging designed to maximise the impact of the loudspeaker enclosures whilst having the least effect on the aesthetics and appearance of the Giants themselves. The Explorer’s system included KIVA-II and KARA speakers with SB18 subs, the Little Giant’s system included KARA, ARCS Wides and SB18 subs all powered by L-Acoustics LA12X amps, with a Midas M32R digital mixer on each of the Giants. Much of the event comprised the Giants parading along the streets of Liverpool’s city centre, and throughout the journey, they were always accompanied by “The Music Truck”, a flatbed containing a full live band, complete with a 24 element L-Acoustics KARA system with four L-Acoustics X12s for side fills and four ARCS-II for rear coverage, together with ten SB18 subs, all artfully stacked and fitted to ensure the musicians also had plenty of room. The mixing console on the truck was a DiGiCo SD10, chosen for its power and small size running with a collection of out-board effects including a Lexicon PCM92 reverb / effects processor, a TC M4000 reverb unit, three Empirical Labs EL8-X distressors, an API stereo compressor and a dbx 160SL dual compressor all encapsulated in an Adlib FX rack. There were areas along the parade route where the Giants would stop to perform large scenes, and typically these locations attracted the biggest audiences, so Adlib provided large hangs of PA to reinforce the mobile systems. Given the show’s fast pace, central location and audience size, Adlib decided to utilise large cranes to fly the audio systems so the appropriate amount of PA could be used for the larger scenes. This was a smart decision that also meant the same PA system could be used more than once in different locations over the course of the event. During the planning process Leah worked diligently with the teams from STS who provided the backline for the Music Truck, locally based John Such Cranes, to source the requisite plant on site, and with Gary Hodson from Hodson Crane Hire, who provided a number of Hiab loader cranes for the event.